Mr. Happy's Hat HAT! Own or give a handsome dark blue baseball cap with an embroidered Mr. 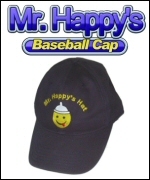 Happy's Hat logo. It has an adjustable band on the back and a hidden patented Pro-Pocket™ compartment just the perfect size to store your Mr. Happy's Hat condoms or whatever you like. Walk with confidence with Mr. Happy's smiling face above yours. Shipping and handling is just $4.99 to US customers. Please email us for information about international shipping.